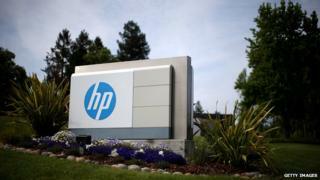 Technology giant Hewlett-Packard, known as HP, is to split itself into two separate companies. The US firm will separate its better-performing computer and printer business from its corporate hardware and services operations. Shareholders will be given a stake in both businesses. The split is part of a radical restructuring plan, which has already resulted in tens of thousands of job cuts in recent years. Investors cheered the news, sending HP's shares up nearly 5% in early trading on Wall Street. The firm is now in the fourth year of its five-year turnaround plan, aimed at helping the firm adapt to the new era of mobile and online computing. Current chief executive Meg Whitman, who has the job of reviving the fortunes of the 75-year-old firm, will head the new spin-off, Hewlett Packard Enterprise. This will house the corporate hardware and services operations. She will also be chairman of HP's printing and PC business, HP Inc, which last quarter accounted for about half its revenue and profit. Ms Whitman said the split would give both firms the "flexibility they need to adapt quickly to market and customer dynamics". "We can [now] more aggressively go after the opportunities created by a rapidly changing market," she added. HP said it expected the division to be complete by the end of the 2015 financial year. Analysts said it was still unclear how the split would help HP to compete against its rivals, and whether the two divisions would ultimately end up competing with one another. "Both operations have seen declining revenue, and many are likely to question whether independence can change their fortunes," said Arnaud Gagneux at analyst firm CCS Insight. "The cost of the separate marketing, finance and purchasing departments for the two entities will increase HP's spending, and the loss of some economies of scale may affect HP when purchasing components." However, Cantor Fitzgerald analyst Brian White said that separating into two companies would give HP the option to sell off one or even both businesses if an attractive offer was made. The division of HP's businesses comes at a time when other large tech firms are being urged to break up. Last week, online auction site eBay announced it was splitting off its payments system PayPal into a separate company. HP has been under pressure from newer rivals such as Chinese firm Lenovo, which overtook HP as the world's largest PC maker in 2012. Third-ranked US rival Dell was taken private last year. Founded by Bill Hewlett and Dave Packard in 1939, HP helped usher in the PC revolution and now has more than 300,000 employees globally.